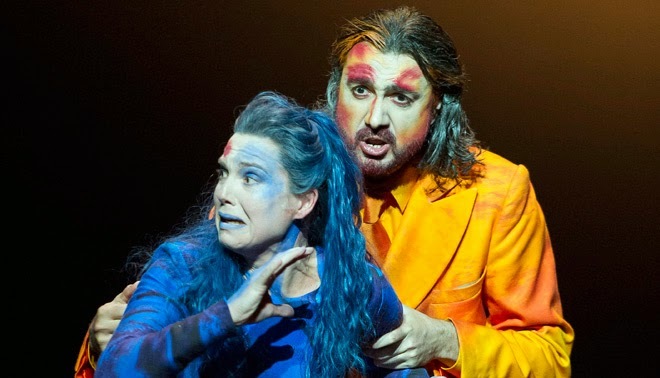 5th October 2014: So to a second, even rarer Rossini opera with WNO. Many of the elements were carried over from the previous evening’s “Guillaume Tell” including the two hardest working tenors in the country : Nicky Spence as yet another nasty bit of work, this time the High Priest Mambre and, even more astonishingly, Barry Banks playing Aaron on the day after playing the near impossible role of Arnold (when most normal singers would be closeted in a darkened room with a cold compress). The same production team utilised scenic elements from Tell with new and, mercifully, much more colourful fascias. Indeed this production, a riot of colour throughout came as a blessed relief after the dour greys of the previous evening. David Pountney seemed to be having a lot more fun with this, arguably lesser, work although there were moments where real acting was exchanged for agitated but unmotivated movement up and down the steps of the set. Inevitably Rossini’s envisaged massive effects of showers of fire and parting walls of water had to be suggested rather than fully realised (to the audible displeasure of one old lady) but budgets are budgets. They certainly must have saved a few coins in the meter at the beginning of the work, which was performed in total darkness (only broken by Carlo Rizzi’s luminous baton). This conceit didn’t really work - genuine total darkness for a period of nearly fifteen minutes feels interminable and the old adage of dark lighting equalling a loss of audibility was proved abundantly true. 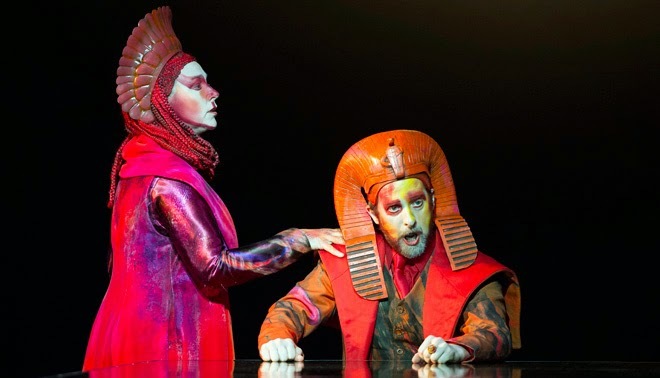 Although the opera is titled Moses, the fascination comes mainly from the characters who move in his orbit. Moses is the only character who does not develop at all - portrayed by Pountney and the splendidly imposing and cavernous Miklós Sebestyén as an immovable, essentially unsympathetic religious zealot he remains unwavering in the face of disasters heaped on the other characters around him. I do not imagine that Sebestyén’s costumed resemblance to Osama Bin Laden was wholly accidental. His voice, both dominating and rich, is just about perfect for this role. Give him a few years and he will be spot on casting for the great Verdi bass roles. Andrew Foster-Williams made a fundamentally sympathetic character of Faraone. His vacillating ruler, pulled in all directions by his family, priests and enemies is primarily a victim rather than an oppressor. Fortunately his singing (over a hugely demanding range) remained splendidly forthright and vigorous throughout. I wish I could have enjoyed the performance of David Alegret as his son, Orsiride, as much. It is, to be fair, extremely difficult to make a character who behaves with such a blind sense of entitlement overtly sympathetic but Alegret’s dry tone and Bergonzi-type arm acting made it near impossible. It was unfortunate for Alegret that he was paired with the riveting Elcia of Claire Booth whose own acting revealed quite how little he was doing onstage. Elcia, written for the super-diva Isabella Colbran, is a big step up for Booth and it is a challenge that, by and large, she meets. Her final scene of grief and madness at Orsiride’s death (struck down by her own God) was an astonishing dramatic achievement. All she lacks, at present, is the final few decibels that would allow her to soar over the big ensembles. Nevertheless, this was already a great performance. Christine Rice was hugely sympathetic as Faraone’s wife, Amaltea. Like many of the roles in the opera, the character exposure is uneven. After a demanding scene at the opening of the opera, Amaltea is relegated to the role of the voice of reason for much of the remainder. Fortunately she does have one remaining solo scene and the long lines of this prayerful meditation (and the huge quartet which follows soon after) proved a perfect match for Rice’s gifts. As already noted both Barry Banks and Nicky Spence provided sterling support as Aaron and Mambre and the roster of principals was rounded off by Leah-Marian Jones making much of little as Amenofi. 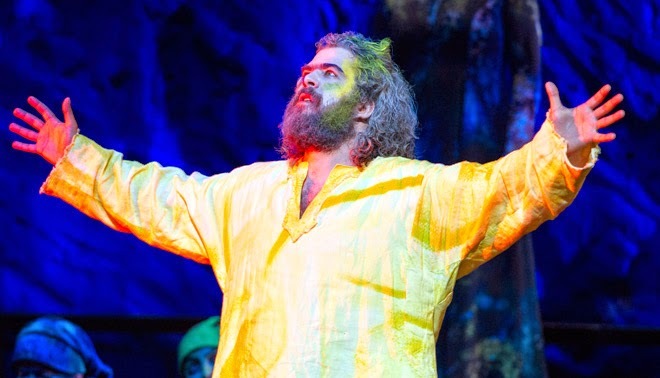 The WNO chorus made their usual wonderful sound and busily portrayed both the Hebrew and Egyptian nations throughout the evening until the final unexpected scene of reconciliation on the far side of the Red Sea. This was the second of two extremely strong Rossini evenings at WNO and continues their dedication to the Bel Canto period in fine style. Can I put in a plea for consideration of “Il Pirata” and “La Straniera” for sometime in the future seasons?